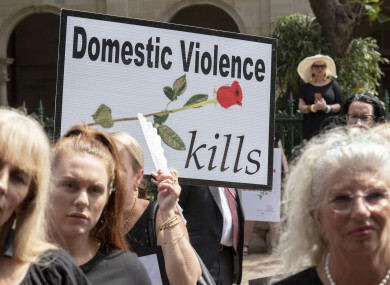 Rallies against domestic violence have taken place around the world, the Red Rose rally was held in Australia last month. “A WOMAN WILL often blame herself for abuse” is one of many myths that Cope Galway is trying to dispel as part of the UN’s 16 days of activism against gender-based violence, which starts today. The Galway based domestic abuse service will be releasing 16 daily blogs on its website in an attempt to shatter 16 myths around domestic abuse. In 2017, Cope Galway worked with 339 women and 214 children, providing 615 outreach appointments to 210 women and 225 court accompaniments to 189 women. Carol Baumann, Cope Galway’s service manager, says that the aim of the blog is to raise awareness around the larger issue of domestic abuse and equip a woman who is being abused to recognise this and to help her find safety and support. “A woman often blames herself for abuse or might see herself as a ‘strong, capable’ person who would never allow herself to be abused. “The daily blogs we’ve planned will challenge ideas around, for example, abuse being part of certain cultures, or that a woman should have left an abusive spouse by now. We also address myths around what constitutes ‘domestic abuse’, which can often be insidious, verbal, financial or emotional abuse. We hope that if this information resonates, a woman will be empowered to get in touch with us for help, safety and support. A safety planning leaflet, which will contain information to assist a woman to plan for her safety in an abusive situation, will also be released by Cope on 10 December the final day of the International 16 Days of Action campaign. According to the European Commission, one in three women in the EU have been a victim of physical and/or sexual violence since the age of 15, over half of women have experienced sexual harassment and one in 20 has been raped. A recent report by Women’s Aid has found the vast majority of women murdered in Ireland are killed by a man they know, over half of women were killed by their current or former partner and 61% of women were killed in their own homes. The UN’s 16 days of activism against gender-based violence coincides with Justice Minister Charlie Flanagan’s recent announcement that the Istanbul Convention will be ratified next January. The Istanbul Convention aims to prevent violence against women and was adopted by the Council of Europe in 2011, entered into force in August 2014 and was signed by the EU in June 2017. Ireland South MEP Deirdre Clune has described the Convention as one of the most comprehensive international treaties on fighting violence against women. We must do all we can to protect women and children against violence. “There must come an end to violence against women and girls around the world. Events like those happening next week will highlight the issues and the hardships that women all across the globe face in their daily lives,” Clune said in a statement. The 16 days campaign begins today, International Day Opposing Violence against Women, and ends on 10 December, International Human Rights Day. Email “'A woman often blames herself ': Dispelling myths around domestic abuse ”. Feedback on “'A woman often blames herself ': Dispelling myths around domestic abuse ”.